Though they’re not as numerous as they once were, the red telephone box is one of a handful of images that instantly conjures up visions of England. But it wasn’t always such an icon. When telephone booths first came on to the scene, they were definitely more function than form. Intent on finding something that would look good gracing countless street corners, nooks and crannies, the General Post Office launched a competition in 1923 to upgrade the booths. Three years later, a design by renowned architect Giles Gilbert Scott was chosen. He called it K2 – short for Kiosk 2 – and it was only available in London (that’s a K2 – the big guy – standing next to a K6 in the picture). K3, the version that followed, was made of concrete and was a good deal cheaper to produce than the former cast iron model. Because K4 incorporated elements that almost made it into a mini post office, only 50 of them were installed before they were deemed too costly (not to mention loud and intrusively large) to continue. K5 was a cheap model intended to last only for short periods of time. It wasn’t until the K6 in 1935 that Scott hit upon the icon everyone knows and loves today. Created to celebrate King George V’s Silver Jubilee (though he died before any of them were actually installed), version number six included all of the best pieces of Scott’s prior attempts. Interestingly, many citizens abhorred the bright red color and requested something that fit in with the scenery better. The Post Office obligingly had many of the boxes painted a less jarring grey tone with red accents. Scott probably didn’t care for any of it – he had intended the booths to be silver with a “greeny-blue” interior. K7 came along, of course, but was so roundly criticized that it never left the planning stages. K8 made it out the door but never achieved the popularity of its predecessor. Not many were produced; it’s said that only 12 are in existence today. Scott’s ubiquitous K6 can still be found pretty readily, though it’s an endangered species. At one time there were more than 70,000 of them dotting the landscape; today it’s estimated that less than 10,000 of them are still around. Before Queen Elizabeth came along, a vague representation of the Tudor crown was used on the telephone boxes. 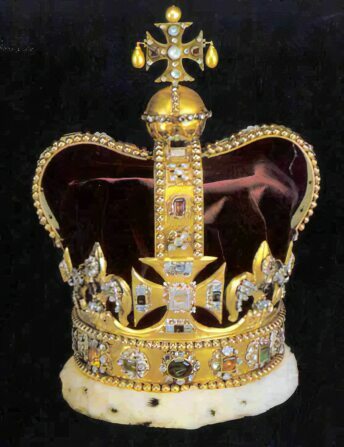 Wanting to put her stamp on things after she ascended to the throne in 1952, QEII had all of the crowns changed to St. Edward’s Crown, the crown actually used in coronations. Scotland opted to keep the Crown of Scotland on theirs, and so all K6 boxes manufactured after 1955 had to be made with a slot in the top to insert the plate with the correct crown depending on the location of the booth. Now that the booths are largely falling into disuse, people are getting creative with repurposing them. There’s a mini-library in Westbury-sub-Mendip, a Somerset man who converted one into a bathroom, one in Prickwillow that has been made into what must be one of the smallest art galleries ever made and a box located on a dock in the Virgin Islands that now serves as a handy outdoor shower. If you’ve never had the experience of standing in a red telephone box, now you can – virtually.